You have fans who look up to you and follow your every move. Being in the spotlight is kind of like being a superhero: you can use your fame for good or for bad. With fame comes great responsibility. Not all of you have stellar role-model credentials. Not all of you always realize that some of your actions and words might influence your followers’ outlook on the bad choices they could make. Whatever you say or do will be seen and scrutinized. It would stand to reason that you should be particularly careful when it comes to being polite to others, following the proper rules of etiquette and maintaining a professional image. Internet slurs are, sadly, the price you have to pay every so often, in order to reach your fans directly via Twitch, Twitter, Reddit, Facebook, YouTube, ask.fm etc. If you can’t take the heat, you might not be cut out for being a public figure. However vitriolic some of your critics might be, an-eye-for-an-eye reaction is never a good idea. You should be the ones setting up a good example. If you think that making fun of someone is harmless, you are wrong. If you think ad hominem attacks are okay, you are wrong, again. If you think alcoholism and depressive disorders are laughing matters, you are wrong, not to mention extremely cruel. If you think being a bystander when one of your peers does it is fine, you are wrong. By shying away from pointing the finger you are, in fact, rewarding the behavior. All of us have the obligation to think about how we are treating other people. What might seem funny or harmless may end up being severely hurtful. Bullying has to stop, and it has to start with you, especially if we want Dota 2 to grow and be taken seriously. 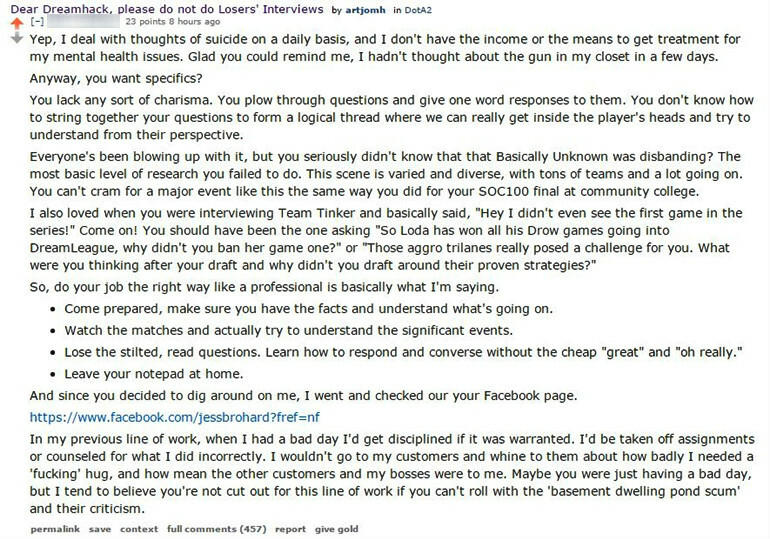 Dota 2 host, reporter and streamer Jess Brohard responded to one of the people criticizing her interviewing skills on Reddit by digging up and exposing his alcoholism and suicidal behavior. 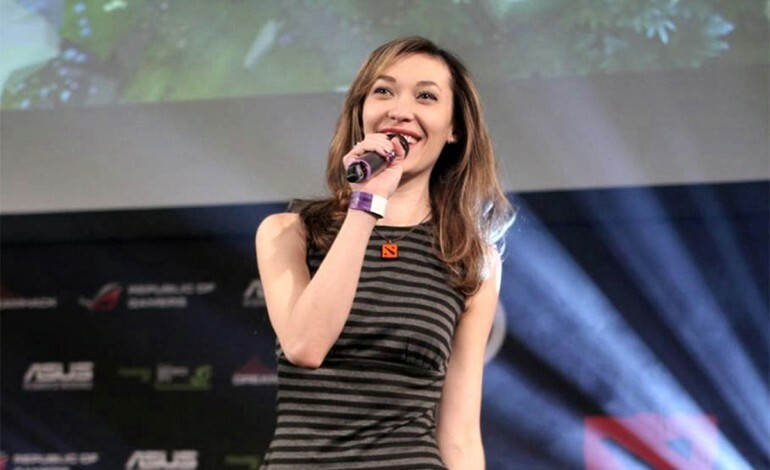 Off-putting to the extreme, her gesture is raising serious questions about whether she should be allowed to return to the Dota 2 spotlight. People can acknowledge and learn from their mistakes and clean up their acts. Rehabilitation should never be taken off the table. 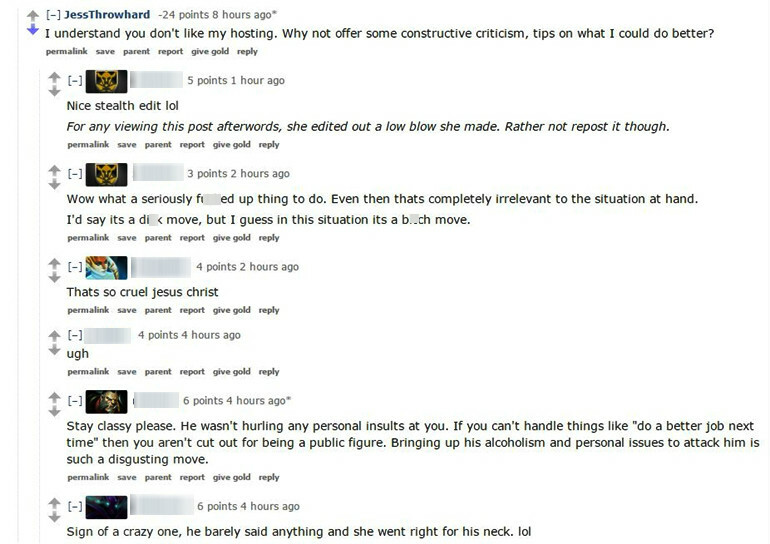 Sadly, Jess Brohard has not shown any signs of remorse and decided to simply edit her Reddit reply, instead of issuing an apology. WTF guys,, this drama is over, She even publicly apologize !! Its not an easy life when every little mistake people gonna see it and talk about it for weeks! She was just really stressed at the time and didn’t think clearly. But, again she should know that the community look up to the personality and should not set a bad example.